by Edward M Kandel Coat of Arms no 146 Summer 1989. The visual impact of a coat of arms can excite by its sheer colour and artistic merit but it should be remembered that while arms make an immediate appeal to the eye the Language of Blazon, their written description, has claims upon our attention. This article gives but a small selection of some of the terms employed but perhaps enough to suggest that a study of the Language well repays effort and that for a fuller and more complete appreciation of Heraldry both the emblazoned shield and its written description go hand in hand and that each complements the other. The word “blazon” comes from the German “blazen”, to blow a trumpet, as this was no doubt the manner of the introductory flourish to attract the attention of combatants and spectators at a tournament at the entry of a competitor at which time he would be recognised by his arms. Let us now consider the blazon “Per Bend Argent and Ermine a Bend embattled counter embattled Azure Gutté d’Eau plain cottised Gules between in chief a Unicorn rampant queue fourché Vert crined and unguled Or and in base a Mullet Sable on a Chief engrailed of the third a Lymphad proper between a Bezant and a Plate”. To the armorist this immediately suggests a shield resplendent with gold and silver, vivid and gay with red, blue and green and dignified with ermine. This is as it should be for the Art of Heraldry concerns itself with immediate and unmistakable recognition by means of a visible display within a specific artistic discipline. While it is firmly rooted in the past it continues to flourish but the fact of its foundation in the Middle Ages gives it an impressive stature and dignity. The emblazoned shield, even if it be a contemporary creation, can display elements from a colourful past but so can the Language of Blazon, that technical vocabulary which so successfully describes arms with neither confusion nor tautology, contains many words and phrases from bygone times, is as traditional as the emblazoned shield, adds its own share to the mystique of the noble Art and Science and fascinates by its picturesque expressions and their philological origins. The Language of Blazon began its development when the nobility of Europe met in the Holy Land engaged upon the 12th century Crusade. Many languages were spoken and even that of the English crusaders of armigerous status derived partially from Norman-French. 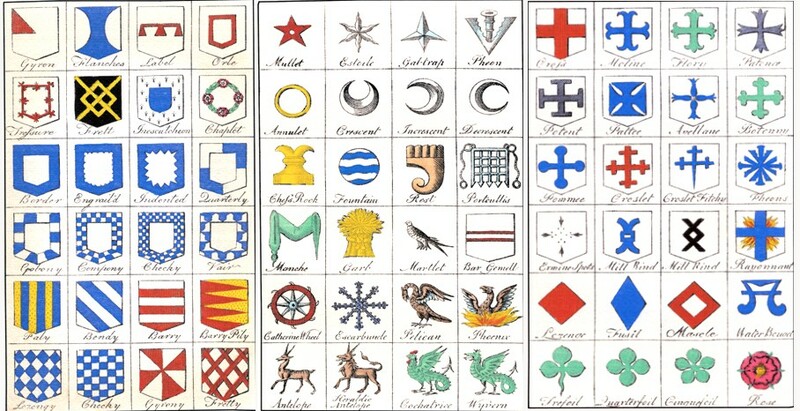 Thus there developed a vocabulary with elements from several languages which was used to describe a coat of arms. Examination of the Blazon of the imaginary arms given above explains the technical terms employed and exhibits the diversity of origin of this linguistic tapestry. Per Bend. Divided diagonally from top right to bottom left. It must be remembered that right (dexter) and left (sinister) are those of one behind the shield, carrying it. Argent. Silver, one of the two Metals employed (the other being Or, gold). From Latin “argentum” through French. Ermine. One of the Furs being a white fur showing black tails. Bend. A diagonal piece from top right to bottom left. A bend which runs in the opposite diagonal direction is known in English Heraldry as a “bend sinister”. The French call this “une barre” and an imperfect understanding that one is the same as the other gave rise to that figure unknown to Heraldry but employed by authors of romantic novels, the “bar sinister”. Because certain charges may be placed in bend sinister sometimes to indicate illegitimate descent the “bar sinister” and the “wrong side of the blanket” are now irretrievably connected although an English “bar” is a horizontal figure and thus can be neither dexter nor sinister. Embattled. A line of partition crenellated as are the embrasures of a battlement. A piece in bend, bend sinister or horizontal usually has only its top edge embattled but if it is embattled also on its lower edge it is “embattled counter embattled”. Azure. Blue, one of the Colours. Probably from the Arabic “lajward”, blue stone through Latin “lapis lazuli” and French “azure”. Gutté d’Eau. Strewn with white droplets, from Latin “gutta”, a drop through French “goutte”. There are a number of other types of this strewing which have been given picturesque names and examples are “gutté de larmes” (blue tear drops), “de sang” (red drops of blood), “de poix” (black drops of pitch), and “d’huile” (green drops of oil). Cottised. From Latin “costa”, side through French “côte”. Cottises are diminutives of the piece alongside and parallel to which they run. A “bend cottised” therefore has two bendlets running parallel to it, one on the upper and one on the lower side. In this case the bendlets are “plain cottised” as they have straight edges and are not embattled as the bend which they accompany. Gules. Red, one of the Colours. At least two of the several suggested origins appear to be feasible. Latin “gula”, the throat, suggests the redness of the gullet of an animal with open jaws although the Arabic “gul” also has claims as in ancient Persia it was reputed that the area known as Gulistan produced the reddest roses. In chief. At the top. In this case the cottised bend is between the Unicorn and the Mullet and as the higher is described first “in chief” could be omitted as could “in base”, the position of the Mullet. Unicorn rampant. The unicorn, in common with other beasts depicted in Heraldry, can be shown in a number of positions. “Rampant” is rearing up on its hind legs. Examples of other positions are “statant” (standing with all four legs on the ground), “couchant” (lying down), “sejant” (sitting), and “dormant” (asleep). Unless so specified the beast has its head to the dexter and looks to the dexter but if it is looking out of the shield at the beholder it is “guardant”. Looking backwards is “reguardant”. Queue fourché. With a forked tail from French “fourcher”, to branch off. It is important that the tail is shown with a single root and that the split occurs some half way up because if the split in the tail is too low it may be confused with a tail “double queued” (with two tails). Vert. Green, one of the Colours from Latin “viridis” through French and from Middle English we also have “verd” from which comes “verdure”, greenery. The old Heraldic term “verdoy” meant charged with green leaves. That the unicorn is green is not because this creature of fable can presumably be of any colour. Unless beasts are blazoned “proper” (in their natural colours) Heraldry has little in common with Zoology and we can therefore meet, amongst other improbables, silver lions, green eagles, golden wolves and blue eels as well as beasts divided between two tinctures. What is particularly important is that beasts are depicted as representative of their supposed attributes. 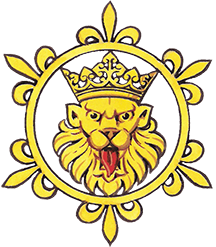 The heraldic Lion, for example, is not the beast of circus or menagerie but a picture which exhibits the distillation of lithe ferocity, savagery, nobility and fearlessness. Crined. Of the hair or mane from Latin “crinis” (hair) through French “crin” (horsehair). In this case the green unicorn has a mane and any other tufts of hair of gold. Unguled. Of the hooves, Latin “ungula” a hoof. The unicorn has golden hooves. Mullet. A spur rowel, French “molet”. If the mullet has a central hole it is a “mullet pierced”. The mullet is usually shown as a five pointed star but occasionally it has more points and if this is so it is mentioned in the blazon as, for instance, “a mullet of six points”. This particular charge has occasionally been employed by Jewish armigers because the six-pointed star resembles the “Star of David”. Sable. Black, one of the Colours. Not the fur of the same name but probably from the Latin “sabulum” (gravel). Chief. A horizontal piece along the top of the shield. Engrailed. A line of partition which resembles a number of conjoined half circles. Old French “graal” or “grael” was a cup or chalice and “engrailed” is thus a number of joined cup shapes. Of the third. As the colour Azure has already been mentioned in the Blazon “of the third” means of the third mentioned tincture and obviates the need for repeating “Azure”. Lymphad. A galley with oars, sail and flags flying at the mast, bow and stern from Gaelic “lang fada”, a longboat. Proper. In its natural colours. Occasionally the sail of the lymphad is of some particular tincture or carries some charge and it is so blazoned. The flags may also be blazoned as in the arms of the Company of Scotland Trading to Africa and the Indies where the lymphad is “flagged of Scotland” (blue flags with a white St. Andrew’s Cross). Bezant. Being named before the Plate the bezant is to the dexter of the chief. A bezant was a golden coin minted in Byzantium and would have been familiar to Crusaders. Plate. A silver roundel so called perhaps because it resembled a pewter or silver plate but more probably from the old Spanish coin called a “plate” (a silver piece of money). Roundels of various tinctures are given particular names. A “pomeis” (French “pomme”, apple) is a green roundel and a “hurt” is blue either from its resemblance to a hurtleberry or from French “heurt”, a blow and thus the resulting blue bruise. A red roundel is a “torteau”, Spanish “torta”, a cake. A “gunstone” is a black roundel because it resembled an early cannon ball. It may seem inappropriate that Heraldry should adopt this term as in popular belief the knight in armour and firearms were not contemporaneous. This is untrue and from the poem “The Siege of Caerlaverock” we are told that two military innovations were introduced by the English to Scotland in the year 1300, “crakkis” and “tymbris”, otherwise cannon and heraldic crests. It is hoped that this fraction of Blazon’s vocabulary suffices to provide an insight into its richness and diversity and that those attracted to Heraldry will find that a study of its terms and expressions is in its way a voyage of surprising discovery. From an examination of the Language of Blazon we can become familiar with a multitude of objects known in the Middle Ages, we can appreciate the breadth of its catchment area and philological implications of words which had their origin when European rather than national chivalry was virtually unified and we can be fascinated by the magic of a language which in its way is as interesting, exciting and picturesque as the arms which it describes. Some seventy years ago Sir W. H. St. John Hope suggested that plain English should be employed to describe and record arms. He wrote that “the decadence of heraldry during the Tudor period … began to mask (the heralds’) ignorance with needless elaboration of heraldic nomenclature” and that “what deters so many people from a study of heraldry is the mystifying blazon in which even the officials of today (i.e. 1913) wrap up the description of quite simple arms”. Another writer has pointed out that “every specialised profession or pursuit develops its own jargon unintelligible to the layman” and cites “nisi prius (the Law), bareboat charter (shipping), baton cut (precious stones), deleted vocals (gramophone records) or slightly ullaged (wine)”. Why therefore should armorists give up their own technical and time-honoured language and is there any evidence that the “jargon” of Blazon deters many more studying heraldry? Why should “Gold two ramping lions back to back with silver crowns about their necks and a chief azure on the chief three false roundels of gold” be preferred to “Or two Lions addorsed Gules ducally gorged Argent on a Chief Azure three Annulets of the first”? The former is, in its way, as precise as the latter but the spirit of tradition and romance is woefully missing. Could those who advocated plain English have been, in the words of Julian Franklyn, “deaf to euphony, blind to beauty” and would anybody today wish to abandon the fascinating terms of Blazon, “this fairy filigree language … as vital to heraldry as are the shining metals and glowing tinctures of the great art”?